Leh Ladakh 15 Days Itinerary – How to Plan Your Trip? When you are on a 15 days trip to Ladakh, number of ways you can plan this journey can be endless. You will be able to cover almost all the places that are worth visiting without stressing yourself with long hours of travel every day. It will really be a relaxed and fun trip with ample of sightseeing involved. As a matter of fact, 14 or 15 days is usually an ideal time that I recommend to everyone for Ladakh trip. The town of Leh is the second largest district in India after Kutch in Gujarat. So yes, the number of places to see here are in ample; and even 15 days can start to feel a bit less sometimes. How can you plan your Leh Ladakh 15 days itinerary to make the best of your time is what I will be discussing in this article. For the sake of this article, I will assume that you are traveling from Delhi. If you were coming from a different place, then only the journey for first and last day will be different; rest of the details will still apply. I will suggest two different type of itineraries. One for a complete road trip to Ladakh starting from Delhi. Second set for people who flew into Ladakh and have all 15 days to spend in Ladakh itself. I am not saying that a road trip to Ladakh cannot be done in lesser number of days. Minimum time required for this trip in my opinion is just 9 days but that will really be a rushed journey. You will be on the road everyday and most of your sightseeing will happen only on the move. But with 15 days in hand, you can easily restrict your travel time to no more than 5 to 6 hours a day; and spend much time in enjoying the natural beauty around you. I will begin with first mentioning an itinerary that I recommend; followed by a few other ways the same journey can be done. If, after reading the article, you have any other questions, you may use the comments section at the bottom of this page to clarify those. Before discussing the itinerary further, let me clarify on a few points first. Mostly, people prefer to plan their trip via Manali but I will recommend reaching Ladakh via Srinagar because of the following reasons. This remains to be the biggest concern for people traveling to Ladakh. Majority of the people traveling from Manali to Leh end up suffering from AMS around Sarchu and Pang. Reason behind this is because the gain in altitude happens suddenly and tremendously. On the other hand, while traveling from Srinagar, you climb up gradually and the journey is spread over a period of 4 days. This gives your body ample time to adjust itself to the height you are bringing it to. If you were traveling with family then I will strongly recommend that you plan via Srinagar only. For more details on what AMS is and how you can handle it, please read How to Handle Acute Mountain Sickness in Ladakh. If you went via Manali then you will also have to arrange for Rohtang permits; without which, you will not be able to cross it. Getting this permit is a hassle in itself and one more thing for your to worry about. It is issued on first come first serve basis and considering the huge tourist crowd in Manali, it is mostly sold out days in advance (and usually bought by the taxi drivers in Manali). If you were unable to get it online then you will have to waste an entire day in Manali obtaining it from DM office. This permit is however not needed if you were coming from other side of the pass towards Manali. So if you went to Ladakh via Srinagar, this permit will not be needed and you will have one less thing to worry about. Let me just mention a few facts and you will understand what I mean. To get to Rohtang, you need to submit your permit at Gulaba check post and average wait time there is about 2 to 3 hours in tourist season. People get their cabs and cars lined up as early as 3 or 4 AM there; and cars continue to climb down from Rohtang till midnight. Traffic jams are becoming common at the pass and you may be stuck in a long line of cars for hours even. So if you want to avoid all of it, go via Srinagar. When traveling to a place like Ladakh; and for as many as 15 days, you must keep at least one day as buffer. The unpredictability of the region will always remain during the trip and you may be forced to extend your stay at any of the places in between. This is the reason why I have kept one day as buffer in the itinerary above. If your trip went well then you can use this day to stay at any of the places per your liking towards the end of the trip. Or you could just return home and relax for a day before getting back to work. Last but not the least is the question of managing fuel. You will be traveling some long distances without a gas station. Once you leave Leh city and head for Nubra valley, there is no fuel station until Manali. So you will have to make arrangements to carry spare fuel. Good part however is that these days, you can get petrol pr Diesel almost everywhere on the route in black. Price would be around Rs. 120 per liter but you won’t have to worry about carrying extra. You can get fuel at Pangong, Hanle, Karzok and even at places like pang and Sarchu. Read Fuel During Ladakh Trip – How to Manage for more details. Now let me run down the itinerary for a better understanding. Get an early start from Delhi so that you can reach Jammu in time. It is a total of 600 kilometers that can easily take you 11 to 12 hours to complete. Road is in awesome condition and it is a smooth drive till Pathankot. There are however some bad patches between Pathankot and Jammu but not too long. If traveling by car then be prepared for a lot of tolls till Pathankot. Don’t wander too deep into Jammu city and stay somewhere closer to the highway to Srinagar. If you were traveling by public transport then you can either catch a direct bus to Jammu from Delhi; or even plan to complete this part of the journey by train. The distance for this day’s travel is about 270 kilometers in total but traffic jams are way too common on Jammu Srinagar highway. It will still take you about 11 to 12 hours to complete so start early; and that is why I recommended you should stay closer to the highway. You will also be crossing the scenic towns of Patnitop and Anantnag on the way. Another way to do this journey is by the historic Mughal road; via Rajouri, Peer ki Gali and Shopian. This is the more scenic of the two routes but is also the longer one; a total of about 330 kilometers. For more details on traveling by this route; please read How to Travel from Jammu to Srinagar by Mughal Road. Depending on your own preference, you can either stay at a hotel in Srinagar or opt for a houseboat. There is a daily bus from Srinagar to Leh that you can board for this journey. It starts early in the morning from Srinagar Bus stand, breaks the journey in Kargil on Day 1 and reaches Leh city on Day 2. You will be spending this day in Leh city itself. The most important thing to do this day will be to arrange permits for visiting other parts of Ladakh. This permit is called Inner Line Permit, or ILP in short; and is mandatory for civilian movement in the region. Without it, you will not be able to go any further then Leh town. It can be obtained from DM office or you can also apply for it online. For a complete step by step guide on obtaining ILP, please read How to Obtain Inner Line Permit for Ladakh. Once you have the permits, you will have the entire day for sightseeing in Leh city; and there is plenty to see. Leh Palace, Shanti Stoopa, Leh Market are some of the most common areas visited by tourists. For a complete list, please read Tourist Attractions in Leh City. Your next destination will be the beautiful Nubra valley. Now once you leave Leh city, you will not be returning back and will continue traveling to Manali straight. You will stay in Diskit for your first day; and spend the next couple of days sightseeing in the valley itself. 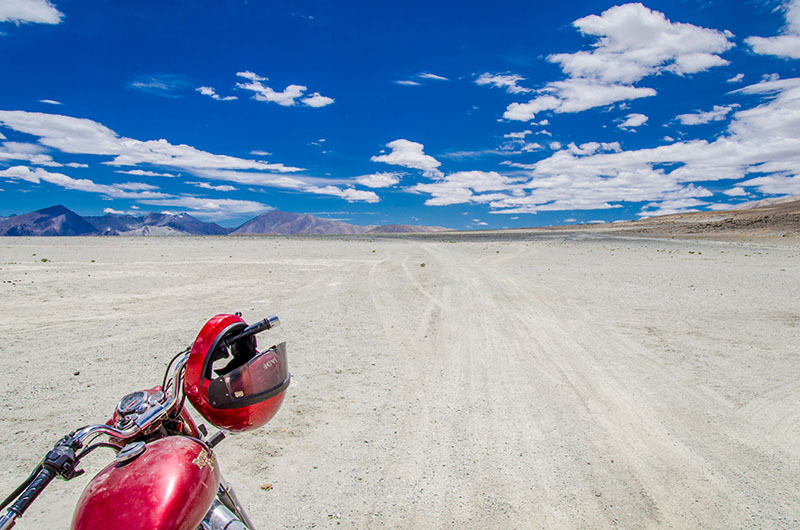 The entire journey from Leh to Diskit will be of about 6 to 7 hours depending on your speed and breaks; and you will also be crossing the high altitude pass of Khardung La on the way. For a list of must visit places in the Valley, please read A Complete List of Tourist Attractions in Nubra Valley. You will be spending this day in Nubra valley itself. From Diskit, continue driving another 100 odd kilometers to the small yet very beautiful village of Turtuk. This is the last point till where civilians area allowed and after this, it is just a steep climb to Siachen Glacier. Road between Diskit and Turtuk is a mix of average and bad and can take about 3 to 4 hours to complete. Since you have plenty of time today, you can also spend some time sightseeing in Diskit before you start; and visiting places en route. From Turtuk, drive back all the way to Diskit and then to Khalsar. From Khalsar, you will then reach the town of Panamik and explore the other side of Nubra Valley. Depending on the time you have in hand, you can also continue driving all the way to the village of Warshi, last point till where civilians are allowed. From Warshi, return to Panamik and spend the night there. Get a tankful for fuel done at either Diskit, Hunder or Panamik. Your next destination will be the beautiful lake of Pangong; which over time has become the very symbol of Ladakh. It is in fact this lake that put Ladakh on tourist map after the release of 3 Idiots. From Panamik, drive back to Khalsar and then take the Agham Shyok road to reach Durbuk; and continue driving to Pangong. Total journey will take you about 7 hours depending on your speed and breaks. If you did not get fuel in Diskit then get it from the chadar tents at Pangong. You will be exploring the beautiful Changthang valley today. Roads from here on will be a mix of good, bad and ugly. Continue driving on the banks of Pangong towards Chushul via the village of Man and Merak. After you arrive at Chushul, visit the famous war memorial here and continue your journey to Loma. There is a check post at Loma where you will register yourself and turn left on the 50 kilometers long road to Hanle. Next place to visit on our itinerary is the lake of Tso Moriri. It is smaller in size than Pangong but no less in beauty. Karzok is the village on its banks and that is where you will be staying for the night on Day 11. From Hanle, you will first drive back 50 kilometers to Loma and then take the road towards Sumdo via Nyoma and Mahe. Road until Mahe will be good and average till Sumdo. After Sumdo, it is completely a dirt trail for the last 50 kilometers till Karzok. For accommodation choices at Karzok, please read How to Plan a Trip to Tso Moriri. From Karzok, drive back 50 kilometers to Sumdo again. Now take the road via Polo Kongka La to drive straight to Tso Kar across the More plains. Road till Polo Kongka La is quite bad but then a smooth drive all the way till Tso Kar. Spend some time at the lake and then you will exit on Manali Leh highway nearby Debring. Now depending on how long you took to reach here, you can either spend the night at Pang; or drive a little further to Sarchu and break the journey there. If you stayed at Pang the night before, then start as early as 7 AM. You will be driving on Manali Leh highway today; which is both famous and notorious at the same time. Your journey for the day will include crossing 4 high altitude passes before you finally make it to Manali by evening. If you were able to reach Pang by 7 AM; or Sarchu by 8 then you should be able to reach Manali by 5 PM easily. Not really much to write about this day except for that this will be a long and monotonous journey back home. You will drive back to Chandigarh and then take NH1 to reach back Delhi. Depending on your speed and breaks, it may take you as many as 14 to 15 hours before you finally made home. You can use this day to stay longer at any of the destinations in the itinerary above. My recommendation however would be to use it on Manali Leh highway. After Karzok, you should drive back to Pang and stay there. From Pang, rather than driving back to Manali, make the journey more relaxed and spend the night in the beautiful village of Jispa. You will then reach Manali on Day 14 and Delhi on Day 15. This was of course just one way that the journey can be done. Based on your own preference and liking, the same journey can be done in multiple other ways. I will suggest a few other alternate versions as well. If you wanted to start the trip from Manali and end at Srinagar, then below is how it will turn out. You will have to keep Rohtang Permit arranged in advance online; or spend a day in Manali getting it. Or you can contact a hotel or travel agent there to arrange it for you. The above itineraries however would be more suitable if you were traveling by your own transport. If you were planning to go by public transport, then I will recommend the itinerary below. I am recommending this plan from Manali side because by public transport, it is easier to go from Manali and return via Srinagar. If you were planning to fly into Ladakh and spend all 15 days there, then you can travel in the following manner. For the itinerary below, I am assuming that you are renting either a private taxi; or a motorcycle in Ladakh. If you wanted to include Zanskar valley in your trip too; then the journey can be done in the following manner. I hope the information above on planning a Leh Ladakh 15 days itinerary was of help. If you have any questions; or need any further details on any part of the trip; please feel free to ask in the comments section below; or at our Community Forum; and I will be glad to answer. I’m planning to follow your 15 day itinerary for the leh ladakh trip from 1st July to 15th July. Hi Suhas – Tent camps will be available at Pangong, Tso Moriri and on Manali Leh route. Don’t opt for tents elsewhere and better stay at a hotel. No need to prebook, just negotiate an on the spot deal after you arrive.